Sberbank's goal was to double its market share in central and eastern Europe within two to three years from 2.1 percent by assets in 2013. VIENNA — Sberbank, Russia's largest lender, will focus on organic growth in central and eastern European operations for the time being while opening a new front in online banking in Germany, its European chief said. The Russian lender is still digesting the eastern European network it bought two years ago from Austria's Volksbanken AG, Sberbank Europe chief executive Mark Arnold told reporters Thursday, so acquisitions in the central and eastern European, or CEE, region are not a priority. But it will open a direct banking operation in Germany in the third quarter of the year, aiming to beat prices from established banks with large branch networks. Direct banks typically offer their services online and over the telephone. "Germany is a large market, and we are just going to dip our toe in the direct banking space," he said. The new bank will function separately from Denizbank, an Austro-Turkish direct lender owned by Sberbank that operates in Germany. An Austrian unit of Russia's number-two bank, VTB, ING's ING-DiBa unit and BNP are also big players there. Arnold saw growth potential without acquisitions in places such as the Czech Republic and Slovakia. In all, Sberbank Europe Group operates in nine CEE markets, where he noted many other banks were cutting back operations or exiting to cut capital requirements or risk exposure. "I think the next year and a half [to] two years, the focus is going to be organic, and clearly Germany is an expansion point," he said. Sberbank Europe swung to a 2013 profit of 5.6 million euros ($7.6 million), a fraction of the $2.1 billion its state-controlled parent earned last year, but the business is a platform for growth as the group diversifies outside Russia. Arnold played down the impact on his business of the tense East-West standoff over the toppling of Ukraine President Viktor Yanukovych this year, which triggered Russia's annexation of the Crimean peninsula and a pro-Russian separatist movement in eastern Ukraine. "Obviously it is sensitive being a Russian bank in this marketplace given what is going on, but nothing of any real note" has hit the bank so far, he said. "The majority issue that we have is more about sentiment than anything else, and that is very hard to fight. We have had some challenges probably in the Slovak and Czech market, where sentiment is probably stronger, but again in the … last couple of weeks things seem to have calmed," he said. Its Ukraine business had 208 million euros ($9.7 million) in assets — less than 2 percent of the European group total — and 38 branches, mostly in the western part of the country. Like other banks, it saw deposits drop this year but they have begun rising again in the past month and a half, Arnold said, adding the biggest hit in Ukraine has been from currency devaluation. 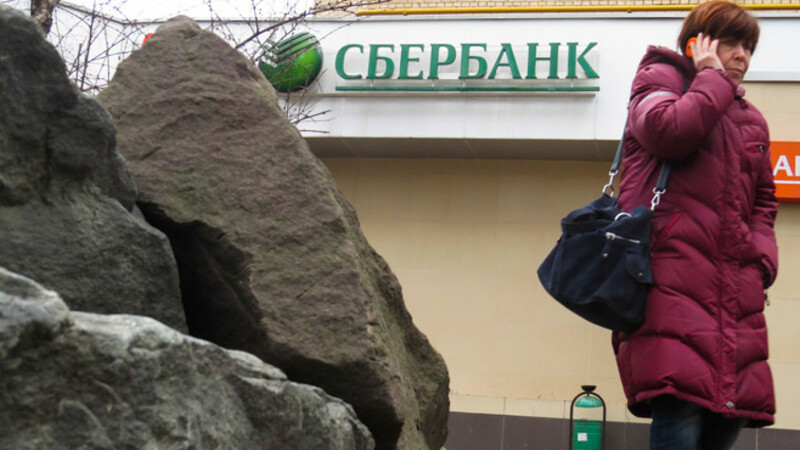 Sberbank Europe's finance chief, Christian Kubitschek, noted the Ukraine business had a nonperforming loan coverage ratio of 62 percent at the end of 2013 and a conservative risk policy. Even in the Czech and Slovak markets, deposits were above the levels at the end of 2013 and rising, he added. Arnold said Sberbank was keen to stay in Hungary, where it was growing but still losing money amid high bank levies. He thought some rivals there would disappear over the next two to three years as Sberbank bides it time and keeps costs under control. He said its priority was to grow organically there but it would look at potential takeovers case by case.